Erika S. is a lobby assistant volunteer for TRC. Her love of all birds started as a young girl. Several years ago she started raising poultry and now lives on a hobby farm with twenty-seven chickens. While she is kept busy greeting the public, coordinating their tours at TRC and many other duties, Erika also finds time to sketch some of the education winged ambassadors. She agreed to be a guest blogger for us so she could share her story and her sketches. We thank Erika for her generous gift of time to volunteer, and we could not be more proud of this next generation of teachers and conservationists. 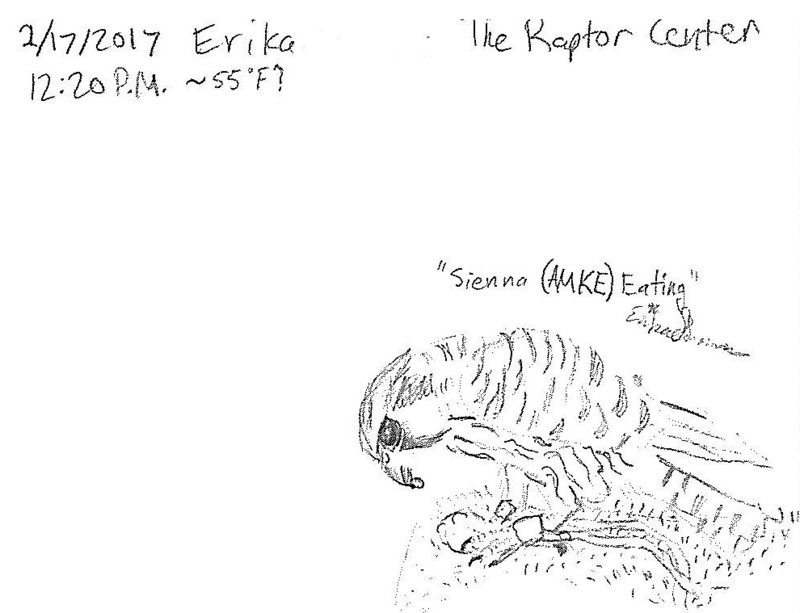 "One year for my birthday, my mom took me on a raptor-themed trip to The Raptor Center, the National Eagle Center, and a birding outing via kayak on the Mississippi River in Wabasha. 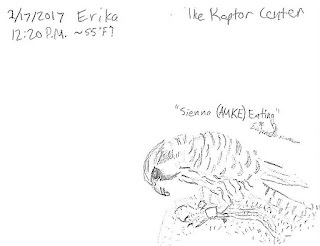 I enjoyed watching and learning about the raptors I saw while on my trip. I never would have guessed I would be volunteering at The Raptor Center just two years later! Last fall, I started volunteering at The Raptor Center, and I have loved every day of it! The staff and other volunteers have taught me a great deal about raptors, and I like showing the items in the biofact cart to visiting kids. 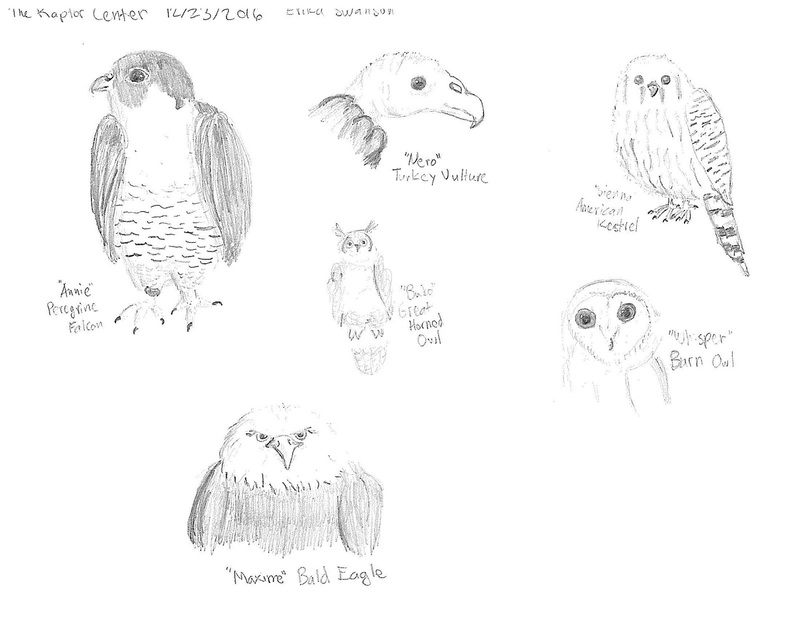 Each week I volunteer, I bring my sketchbook in case I get the chance to draw some of the beautiful raptors. 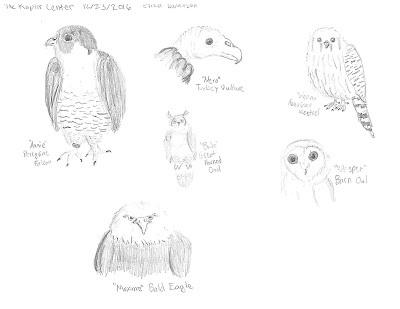 Although I usually drew horses when younger, I have recently started drawing more birds—mainly raptors. I love sketching raptors because it gives me a better sense of their feather patterns, shapes, and other details that I wouldn’t usually notice. I still love all birds, but I am most fascinated with raptors—especially American kestrels. I have recently seen a pair of kestrels near my house and would like to build a kestrel nesting box before next spring. I am also planning to take Cornell University’s online ornithology course next year and later major in biology in college. Someday, I would love to have a job working with raptors and teaching children and adults about the importance of raptors in the ecosystem—just like The Raptor Center does." Thank you, Erika! What a promising future our raptors have thanks to folks like you who take to them young!